Ankle-high Peoples Park Grass. Photo by Ted Friedman. Crackdowns in People’s Park are part of its rhythm as well as its legacy. 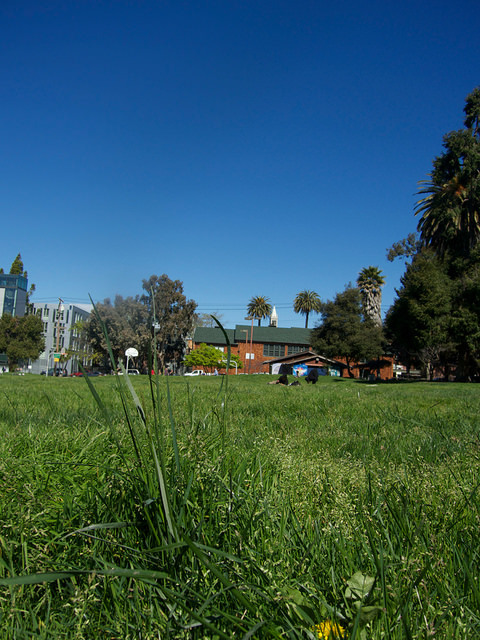 The ankle-high grass of Berkeley’s People’s Park was recently mowed-down by university groundskeepers along with a bunch of people-park-people who got stay-away orders from university police. Park drug busts have burgeoned. At Camp Hate, in People’s Park, Hate Man and some of his fellow campers got seven-day stay-aways. Ecclesiastes tells us: “…a time to keep and a time to throw away.” For the university it was time to throw away people’s belongings in and around Camp Hate, which over-flows to Hillegass/Dwight Way, across from two of Berkeley’s oldest churches. The churches turn its other cheeks to the campers. Such are the seasons in People’s Park where there is a time for everything. A time for busted pot deals, a time to grow campsites, and a time for the university to throw them away. Whatever Happened to Berkeley’s Iconic Hippy Coffee-House? 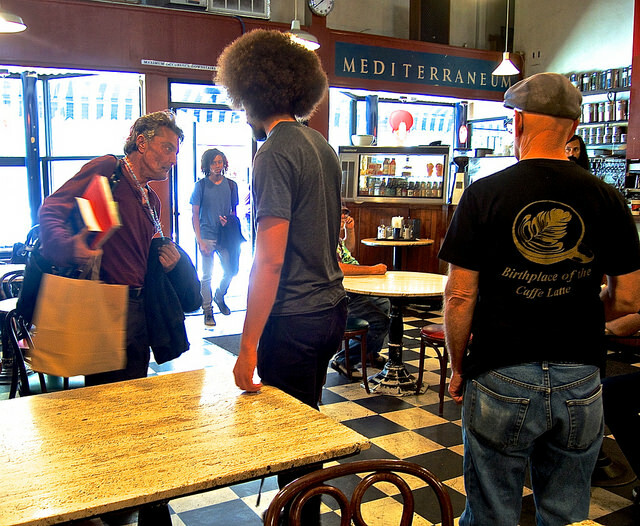 You never know when Berkeley’s, sixty year old Caffe Mediterraneum will explode with youth. College-youth from Cal…and today, eight-year-olds from the peninsula. That You never know who will show may be why Berkeley’s oldest cafe and the first East-Bay baristas, is for sale. You could call the Caffe Mediterraneum a Berkeley coffee-house icon, or you could call it misspelled. Youth was to have saved the Med. When the Med doesn’t explode with youth or anyone else, it can be big, cold, and empty. At the moment there are ten customers (room for 100) beneath a 20 foot ceiling. The next moment could bring a rush of youth. Therein lies the rub. The customer flow is flawed. Erratic customer flow and a long list of missteps has brought the Med to yet another crisis. This would be its third crisis in 60 years. In 1992, Roz Gordon, 83, convened a star-studded poetry reading on the Med mezzanine. It wasn’t a fundraiser, but rather a tribute. Everyone thought the Med was dead. In a way, it was dead, if you compare the Med’s successors to the original joint, which ran like a Swiss watch and payed off like a winning lottery ticket. The ownership change in 1992 from the cafe’s founders to a couple of cooks was perhaps the beginning of the end for the Med. Med Heads as we call ourselves are now sitting here all by ourselves wondering what will become of us. Will we be swept aside for something stylish, that gleams, or stuffed and put on display? If swept aside, at least they’ll have to use a broom and that’s good. Independence Day in Berkeley, as the contrarians of Berkeley conceive it, is one of largess, personal freedom, and L ‘chaim. L ‘chaim? What does L’chaim, even with wine, have to do with the 4th of July? Baruch and Bud makes some sense. 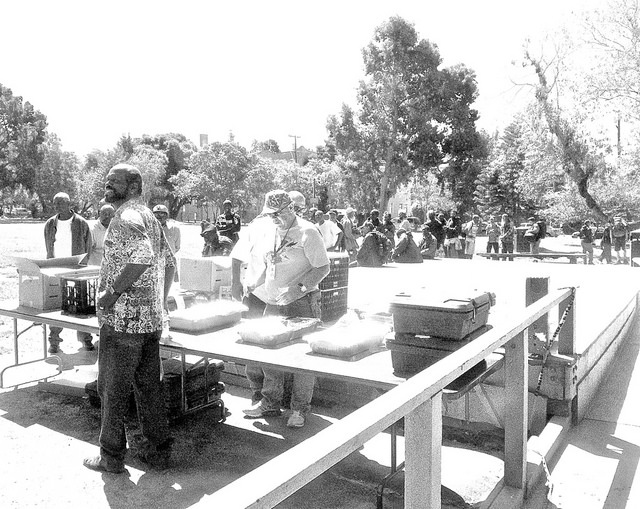 Largess led off Berkeley’s July 4th in People’s Park, as Irven Goodwin, founder of a San Jose veteran’s outreach program, presented some good-looking barbecue. People are always feeding people in People’s Park, but this feed is personal. Goodwin told me he was homeless in People’s Park in 1992 and this was his “give-back” to the park for being there for him. Grateful Goodwin. Photo by Ted Friedman.